I got behind on my blog posts. Sorry ’bout that! But I’m back…hope you enjoy and thanks for reading! Do you like rainstorms? Do you appreciate the pattering sounds of raindrops impacting the roof or the ground or the windows or the top of your umbrella? Do you marvel at the dark clouds moving in, changing the landscape of sky, the rapid temperature change, and the possibility of thunder? I don’t know about you, but a good summer rainstorm can be an amazing thing. Of course, there’s another way to look at it, right? Imagine you’re on your way somewhere urgently for work or school or whatever—and the rain clouds move in and you’re caught in it. No umbrella. No poncho. No raincoat. You’re bound to get soaked. You can’t avoid the puddles. You’re inundated. You’re stuck in the middle of a storm. That can be scary, or ominous, or at least annoying. Your plans have to change [and your clothes have to be changed]. Your shoes slosh around. You may have to take shelter for a bit and wait it out. It can be difficult if you’re caught in a storm. Weather is a universal thread throughout the great literature of the world. Consider the metaphor of storms, which typically represent a great challenge or an obstacle to overcome, and often are metaphors that are both physical and psychological in nature. Indeed, storms present themselves in the great stories and teachings as necessary for growth, essential for learning, and opportunities to discover inner strength and/or wisdom. So there they were, on a boat bound for the “other” side. Then, the winds picked up. So much so, that the boat was rocking. A storm was coming, and the rain threatened to fill the boat up and sink the whole enterprise. The people on the boat were freaking out. He was curled up like a baby, sleeping on a pillow. Wind? Rain? Storms? No problem. Nap time. Seeing this, the followers were upset and blurted out to Jesus: “Teacher, do you not care that we are perishing?” Really? Did they think that Jesus of all people didn’t care? Well, Jesus must’ve cared, because he woke up, got up, and rebuked the wind and talked to the water. Peace. Be silent. And sure enough, the wind ceased and then a great calm began. Now it’s important to note that at the end of the story, the followers on the boat were not in awe of Jesus. They were scared—of the storm with its wind and rain, and scared of Jesus’ calmness in the storm. In fact, the Greek word/phrase to describe them was less awe and more crippling fear mixed with inaction. That leads us to now. Not gonna lie—there are a lot of “storms” out there right now that seem to be invading our boats, stirring the water, tossing us about, creating a climate of fear all around us. Sadly, we in the United States live in a country where the government uses social media to create storms of fear. Donald Trump [yes, I rarely say his name, but in this case it’s necessary] is a distraction artist—using whatever he can to distract our attention from social issues we can actually change, so as to keep his false and faulty sense of control. Those around him stay silent when it comes to human rights issues like the treatment of immigrants at our borders and in detention camps and centers; the separation of families in the name of homeland security and so-called safety; the unprecedented, unchecked presence of ICE and the angry, fearful, ignorant, armed U.S. citizens who direct their anger and fear at black and brown people or anyone who looks like an “other.” All of this is a created storm of distraction and fear. And it’s effective if we let it keep us in our boats, huddled in fear and confusion or worse yet, if we let it keep us from venturing over to the other side of the lake at all. It’s true, friends, that storms exist. They exist outside in the physical world and they exist in our society. But the storms also exist inside us. That which is external is what it is. You and I cannot control other people. Neither can governments or leaders, regardless of what they assume. What happens externally is often beyond our control. The storms come with wind and rain and they rock our boats. And then we’re left with a decision: how will we react inside? Will we let those storms eat us up, engulf our minds and bodies so much that we forget our humanity and stop seeing the humanity in others? Will we take on these external storms inside ourselves and start to claim them as our own storms? This will cripple us; we will cower in fear; we won’t act. We’ll either stay in the boat out of fear or we’ll never get into the boat at all. But there is another path, and it’s one that Jesus of Nazareth invited others to take. It is the path of peace, the path of calm within the storm. It is recognizing the storms and not ignoring them, but not allowing them to affect us negatively. This path is seeing the storms as opportunity for growth, for aha moments, for strength, and for effective action. Yes, it matters how we see the storms. Will you see the rain clouds, will you feel the wind and drops, will you hear the thunder, and will you see it as opportunity? Will you see it as a chance to jump into the boat and go to the other side? To embrace an “other” as a “friend” and to combat the distractions and fear mongering with focused compassion and courageous action? Bring on the storms. We’re in the boat together. Let’s keep going to the other side. I love the rain. I have a lot of rain stories. I’m sure you do, too. I remember the afternoon rains in the summer when I was in Mexico City. The rain fell, and I could see mountains in the distance–clearly from the pedestrian bridge that I walked across on my way to the Mission Church Betél. When it rained, the busy, chaotic city transformed into a busy, chaotic, beautiful, wet mess. Some people hailing microbuses and cabs; others running with umbrellas in hand; some going about their business as if nothing had changed; kids skipped in puddles; students splashed each other and laughed; business men and women hurried to the nearest overhang for shelter. It was a collective halt to life and for me, a moment of Zen—complete peace and pause. The rain made us all stop. But I have another story. I was in Des Moines, Iowa, just out of high school. 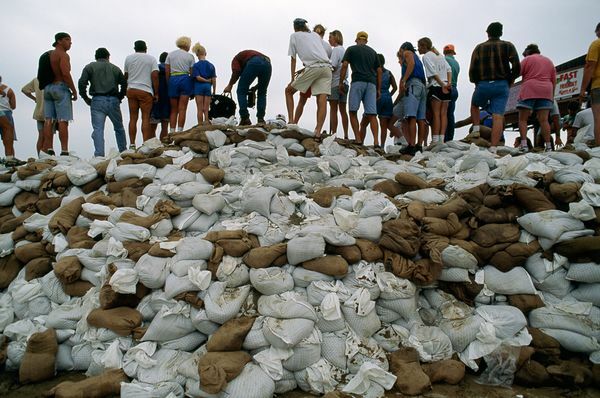 The famous, great flood of 1993–the costliest, most devastating flood in U.S. history, according to U.S. Geological Survey. 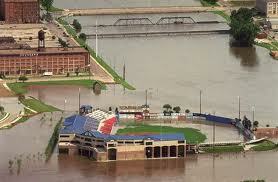 Sec Taylor Stadium, home of the AAA baseball team, the Iowa Cubs, was filled with water. You can see it here. 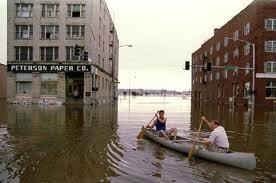 Floodwaters covered as many as 23 million acres of agricultural and urban lands in the Upper Midwest for weeks. The Des Moines River overflowed. And I went to sandbag. I was able to make it into the northern part of Des Moines with my parents to help in the great effort to block more water from engulfing the area. For hours we carried and stacked sandbags. Eventually, some official-looking vehicles pulled up. A man emerged from one of them, wearing a baseball hat, just like me. I didn’t expect this, but it was President Bill Clinton, surveying the damage. I admit to you, though, that while the president stood not three feet away from me, I couldn’t help but be more focused on the sandbagging. I was in flood mode. The rain had grabbed my attention, as had all the hard-working people who were giving their time and energy to help others save their homes. If you will only heed his every commandment that I am commanding you today—loving the Lord your God, and serving him with all your heart and with all your soul—then he will give the rain for your land in its season, the early rain and the later rain, and you will gather in your grain, your wine, and your oil; and he will give grass in your fields for your livestock, and you will eat your fill. The Israelites were not alone. People around the world throughout history have depended on rain to soak the land in order to grow things for eating. Our context is the Americas. The ancient people of Mesoamerica who lived in these lands also depended on rain, because their way of life hinged on rain-fed agriculture. Thus, they were devoted to pleasing the gods of rain, who were known by many names. 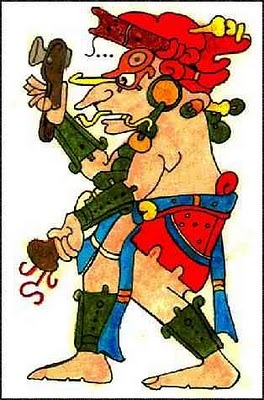 The Zapotecs of Oaxaca, Mexico called the rain Cocijo; the Aztecs honored Tlaloc; and the ancient Mayans’ rain god was called Chaac. Here is a carved figure representing Chaac and an artist’s rendition. Chaac–the god of rain, lightening, and storms–is usually shown holding axes and snakes that he uses to hit the clouds to produce rain. 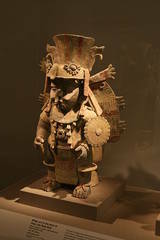 His actions made it possible for the Mayans to grow maize [corn] and other forms of vegetation. They viewed Chaac’s work as part of the natural cycle of life. The Mayans also viewed violent rainstorms, hail, and hurricanes as visual manifestations of Chaac, meant to be seen and respected. I bring us back to these ancients of Mesoamerica for a reason. Today you and I have trouble recognizing nature’s acts with awe and respect. Possibly it is because we predict the weather with sophisticated machinery and at any moment, you and I can check our cellphone for the latest updates. How will my morning commute be on Monday? Will it rain? I can find out in a second. 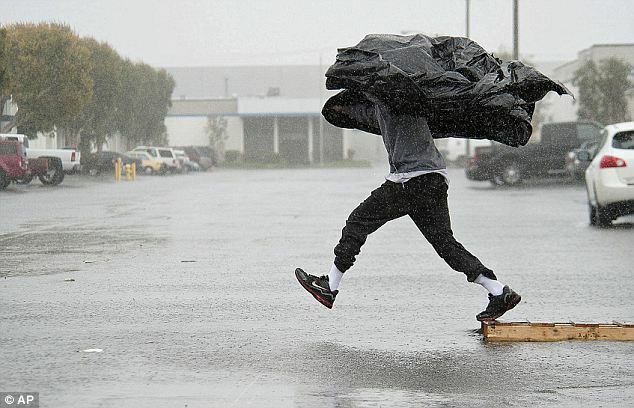 Rain is more annoying than awe-inspiring, because it messes up our day. The thought about rain soaking the land in order to produce food so we can eat just doesn’t cross our minds. We’re disconnected from rain just as we’re disconnected from the natural order of things. After all, if it doesn’t rain, we can use our hoses or sprinklers to water stuff. Looking up to the heavens and praying, dancing, or singing for rain just doesn’t seem necessary. And that’s a problem, if we really want to understand the rain theology of the Noah story in Genesis. Even though Jerusalem is far from the Americas, the Israelites also believed, like the Mayans, that there was an other-worldly source of rain. They too prayed for rain. You see, this kind of theology, or way of thinking about God, is much, much different than our modern-day theology. The ancient Israelites and Mayans understood that they could not control the elements of nature. They were fragile. They saw rain as a gift. And they depended on this gift. Rain was a symbol–a sign of God’s covenant promise to care for humanity. This belief is entirely evident throughout the story of the Israelite’s exile. For 40 years [hmmm…40 days and nights in Noah’s story!] they wandered in the wilderness—the desert. They were dependent upon God for life itself. This was part of how the Israelites understood their intimate relationship with the Creator of all things. They were vulnerable; they were humble; they respected nature and their God. A couple of weeks ago, I had my first experience with a sukkah. A sukkah is a temporary dwelling place for those of the Jewish faith to retreat to during the high holy days of Sukkot [Feast of Tabernacles], right after Yom Kippur. A sukkah is built with natural things to remind us of our human vulnerability. It is symbolically returning to the desert and a spiritual state of humility and dependency. Why do this? Because of what I said before—we are so disconnected from the natural world and our dependency upon rain, sunshine, air, etc., for life. 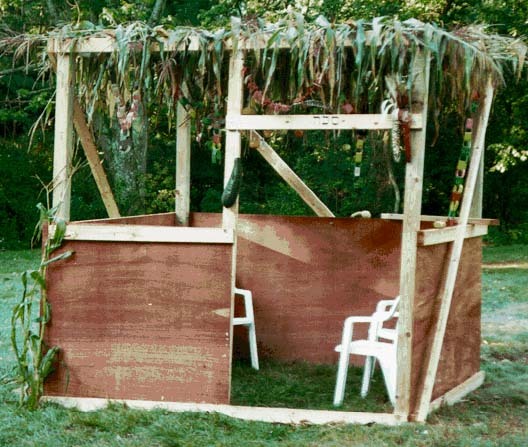 I sat in the sukkah, made of tree branches and twigs, large leaves and tarps. On that particular day, ironically, it rained for the 2 hours that I sat and conversed there with a colleague. I did feel vulnerable. And my mind wandered to a certain week a few years ago in Hawai’i. My wife Maria and I were with some youth from the Community Church of Honolulu, staying about a week at the UCC camp facility, near the place where they filmed the TV show Lost and the movie Jurassic Park. Now honestly, in the three years I lived on the island of Oahu, I did not experience much severe weather at all. Unless of course you count that particular week! It started to rain as it usually does in Hawai’i—very nicely in the afternoon for about 15 minutes. And I expected that after the rain, the sun would emerge suddenly and a Noah rainbow would stretch over the sky. But no such luck. It started to downpour. The wind was so strong that the famous “sideways” rain of the islands began and didn’t let up. For nearly an entire week, it rained. We were supposed to be at this camp so we could foster growth of native plants, clean trails, and help with conservation. But we just got wet. And we had no shelter. This camp was rustic—no buildings. Just tents and some tarps slung over wood walls to make a dining hall/slash meeting space. We were constantly outside. And it constantly kept raining. The nights were treacherous. Thunder. Lightening. Sideways rain. And then, the realization on night #2 that our tents were not going to withstand it all. Water starting dripping inside and then water started seeping in. Our sleeping bags were soaked. We couldn’t sleep. Some of the youth in our group were scared. They yelled from their tent, “What are we going to do?” We had no way of dealing with this—at least not in that moment when it was completely dark and the rain was flying sideways in our faces. So we waited it out. In the morning we hurriedly constructed wooden platforms to place the tents on top of so we could at least be above the soaked ground. It was a helpless feeling. We had to no place to which to run. Nature was attacking us, we felt. Clothes were soaked. Shoes filled with mud and grass. Spirits were low. Frustrations and exhaustion were high. We were vulnerable. You have heard that it was said, ‘Love your neighbor and hate your enemy.’ But I tell you: Love your enemies and pray for those who persecute you, that you may be sons of your Father in heaven. He causes his sun to rise on the evil and the good, and sends rain on the righteous and the unrighteous. Friends, rain is a metaphor for God’s mercy and grace. God sends rain—not to kill or punish, but to restore and provide sustenance. As the Psalmist writes: You sent abundant rain, O God, to refresh the weary land. You and I are meant to be refreshed, too. So notice the rain. Embrace it. Be vulnerable. Stop. Pause. Be refreshed. Refocus and gain new perspective. Discover new ways to love people and to stand up for justice. Let the rain wash over you; let the rain heal the land and heal you; let the rain be a blessing. Amen. Sharer, Robert J., and Loa P. Traxler, 2006, The Ancient Maya. Sixth Edition, Stanford University Press, Stanford, California. Rabbi Lauren Berkun, SE director of educational initiatives, Shalom Hartman Institute of North America.